We built our straw bale house 10 years ago. While living in Winnipeg, I came across a book on straw bale construction at our local library. We did some research and thought about it for awhile, then, because we wanted to move to the country anyways, decided to take the leap and build our own. Before we built, my wife and I visited several existing straw bale houses. After looking at one house, we were referred to another one and then another, and soon discovered that there were more straw bale houses in this area then we had thought! We also attended a number of “building days” at the University of Manitoba. The engineering department had one day a year where they would talk about alternative building techniques. It was a good place to talk with other straw bale builders to see what they were doing. It was here I discovered that one of the professors of structural engineering also had a company, Building Alternatives Inc. that would design and approve alternative building plans. While I was building, a few people expressed concern about the integrity of the style of building itself. When they heard which engineer had approved our plans, their fears dissipated. Initially, we were intrigued with building something that was “different”. We liked the deep window sills and the swooping sides around the windows and doors. The interior walls of a straw bale house are undulating and irregular, covered with a beautiful textured plaster. That irregularity is a feature of this type of house and not necessarily hidden by the plaster. We loved the idea of building with mostly local, natural materials, avoiding plastics and living in a house that “breathes”. As we researched, we learned more of the environmental benefits of straw bale building. We built our house with a wooden frame and then infilled around the frame with straw bales. The bales provided the insulation, and they also supply strength to the walls when the plaster is applied. With conventional building there are “thermal breaks”. These are the parts of the wall where there is a 2×6 stud but no insulation. The wood provides some insulation but not a lot. With straw bale building these thermal breaks are minimized. Another benefit was that we could get much of the materials for our building from the fields right around our house. (Full disclosure: When we were actually building the house, we had a hard time finding small square bales and ended up getting the bales from a farmer in Beausejour.) Finally, straw bale houses by nature, have a lot of mass to them. The plaster on the inside of the house is heavy and thick. More thermal mass in the house reduces temperature fluctuations and theoretically, less energy is needed for heating or cooling. 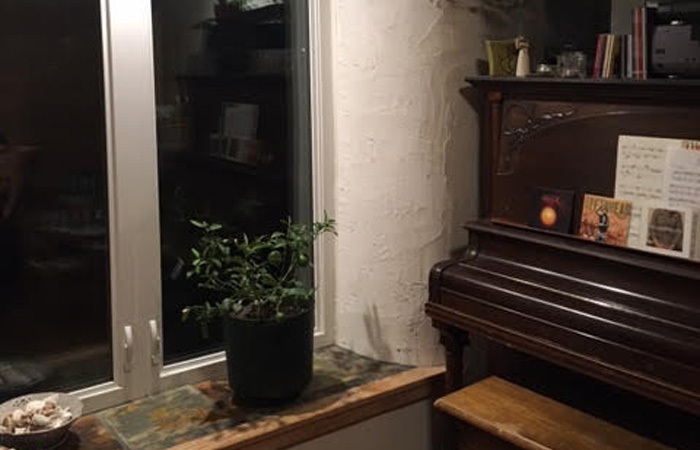 A few other strategies we employed to decrease our energy use, was to orient our house with the bulk of our windows facing south, minimizing the number of windows that we had on the north side. The exterior overhangs let the sun shine into the house in winter and shade the house in the summer. On sunny winter days, we hardly need to stoke our fire because of the heat provided by the sun, despite the frigid temperatures. We also have a thick concrete floor on the main level to add to the mass in the house. Outside the house, we have evacuated thermal tubes to heat our hot water and the pipes in our concrete floor. There are many different ways to build a house and many different materials that can be used. We have enjoyed the use of straw bales as a part of our house.